Buckingham County: Bolling’s Landing | slate river ramblings . . . .
Henry St. George Harris, Bollings Landing, Buckingham County, Va.
During the 19th century, my Harris family, along with many others, received their mail at Bolling’s Landing on the Buckingham shore of the James River. It was located on land owned by Robert M. Bolling and Bolling’s Ferry appears on Jeremy Francis Gilmer’s Civil War-era map. See below. Richard Nicholas also shared the fact that the diary of the Chief Engineer of the James River and Kanawha Canal includes a table listing all the locks on the canal. It places Bolling’s Landing seventy-four miles from Richmond, between locks #21 and #22. Over the years, postmasters at Bolling’s Landing included John M. Brown, Thomas D. Kidd, Frank N. Maxey, Jr., and Samuel L. Burks. 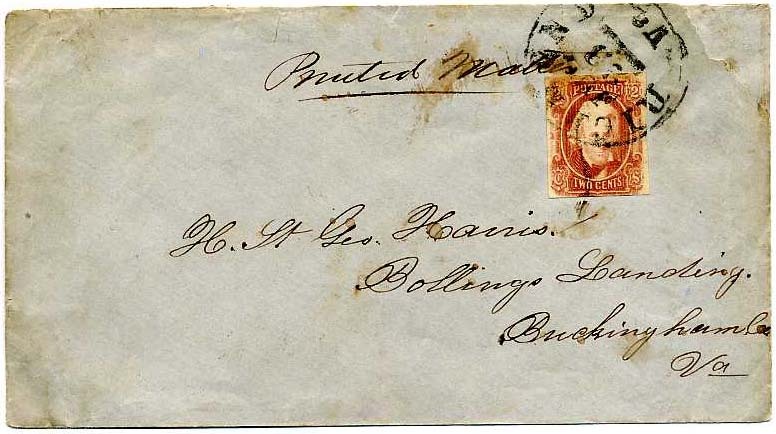 On February 4, 1880, mail delivery to Bolling’s Landing was discontinued and moved to Payne’s Post Office. Joanne – I have certainly enjoyed my several visits to your slateriverramblings blog. I feel like I know the Bolling family of Buckingham county a little better now. I have linked a couple of your great articles to my Markham of Chesterfield website. Linnaeus Bolling married Mary Markham in 1793, and they set up housekeeping at Chellowe in Buckingham county. Mary Markham is my great-grandaunt. I think that their grandson, Dr Linnaeus Bolling, lived at Bolling’s Landing in the 1850-1880 time period. I also have a copy of a envelope that was sent to a “Trent” at Bollings Landing. Thanks, Patt. The Trents were certainly neighbors near Bolling’s Landing. I have long suspected that my George Nicholas Tapscott was Robert Bolling’s overseer on this property, for a short period prior to the war. In 1860, there are two overseers in the immediate area, George Nicholas Tapscott and William A Baird, who might be the overseer at Snowden, then held in the estate of John L. Harris. I’m wondering if either Tapscott or Baird could be overseers for the large “Winfrey’s Tract”. Do you recognize Baird? Postmaster Samuel L. Burks, Jr. | slate river ramblings . . . .